OPEC: Oil market tends to stabilize following Algiers agreement - The Maghreb Times ! 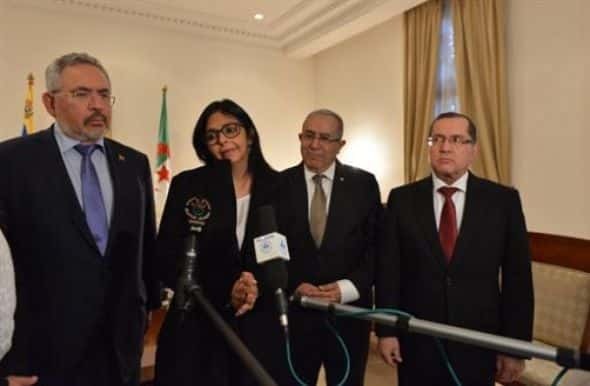 ALGIERS- The oil market tends to stabilize following the Agreement signed in Algiers by the member countries of the Organization of the Petroleum Exporting Countries (OPEC), said Saturday in Algiers Venezuela’s Minister of Foreign Relations Delcy Eloina Rodriguez Gomez. “We see that the oil market tends to stabilize and this has naturally a link with OPEP historic agreement signed in Algiers,” said Venezuelan minister following her meeting with Minister of State, Minister of Foreign Affairs and International Cooperation Ramtane Lamamra, in the presence of the two countries’ energy ministers. “For two years, we have done great work, which resulted in the Agreement of Algiers and that of Vienna too,” she added. Dubbing “very fruitful” the meeting with Lamamra and Energy Minister Nouredine Boutarfa, Rodriguez Gomez said it wrapped up a series of meetings with the officials of various oil producing countries (Russia, Iraq, Iran, Kuwait, Oman, Saudi Arabia and Qatar). “We are extremely pleased that Algiers is the last stopover of our trip because Algeria and Venezuela are tied with very strong links of fraternity,” he added.